AUGUSTA, Maine — Speaking to a conference assembled to discuss the transportation trends of the future, Gov. 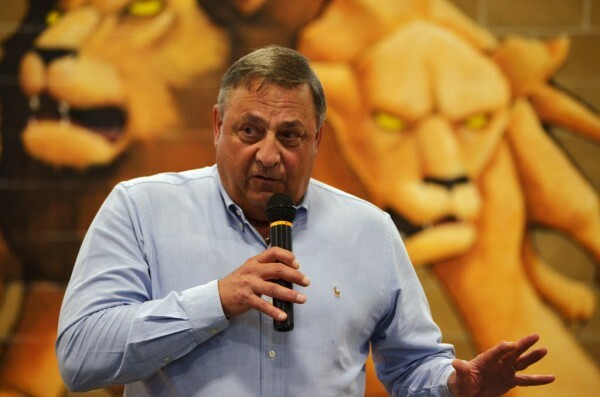 Paul LePage said Thursday that global climate change could have an upside for Maine. The Northeast Passage, also known as the northern sea route, is a maritime route through the Arctic Circle that connects the Atlantic and Pacific oceans, providing a shortcut from the U.S. East Coast to Asia — and all the markets therein — that shaves 40 percent off the distance of the traditional route through the Mediterranean Sea and the Suez Canal. The recession of polar ice has opened up the Northeast Passage, over the past several years. In 2009, a German shipping vessel became the first commercial vessel to use the route, according to The New York Times. In 2011, 18 vessels used the route, the newspaper reported. LePage touted the recently formed relationship between Maine and Icelandic shipping company Eimskip, which made Portland its North American headquarters earlier this year. “With Eimskip coming to Maine, with all the goods things happening — it used to be global warming, I think they call it climate change now — but there are a lot of opportunities developing,” LePage said. Icelandic President Olafur Grimsson, speaking in Portland this May, also cited the partnership between Eimskip and Portland, plus the opening of the Northeast Passage, as a potential boon for Maine and his country. “This could allow Portland to receive cargo from Europe, from Russia, the northern countries and in 10 years or so also from Asia and distribute it throughout the United States,” Grimsson said. The Sierra Club of Maine and top state Democrats criticized the governor’s comments. U.S. Rep Mike Michaud, whose bid to unseat LePage in next year’s gubernatorial election earned the Sierra Club’s endorsement, noted that just this week, regulators shut down Maine’s shrimp fishery because stocks have collapsed, in part due to warming oceans. The state’s clam industry is also in danger because of invasive European green crabs, which have flocked to Maine waters as temperatures rise. “Any potential benefit of allowing climate change to continue unaddressed is far outweighed by the danger of our failure to act,” Michaud said. Maine House Democratic Leader Seth Berry of Bowdoinham said that while any situation could have a silver lining, the governor didn’t adequately recognize the gravity of the threat climate change poses on Maine. Berry mentioned a bill LePage vetoed that would have created a climate change study, and his lack of support for renewable energy. “The bottom line is that climate change represents a major threat to our economy and our way of life here in Maine, and the governor needs to take that threat a whole lot more seriously,” Berry said. In the past, LePage has said he’s not convinced that human activity is causing climate change. On renewable energy, he has said he doesn’t want to pick winners and losers in the energy market, and that he supported renewables only if they were as affordable as traditional energy sources. In November, he instructed his Department of Environmental Protection to convene a working group to summarize the work state agencies are already doing to address changing weather. That came five months after LePage vetoed the Legislature-approved climate change study Berry mentioned. Brent Littlefield, senior political adviser on LePage’s re-election campaign, said critics were taking the governor’s comments out of context. “Certainly, the governor was not making a statement here about environmental policy,” he said. The statements about Eimskip and the Northeast Passage are about jobs, he said. Littlefield added that during LePage’s administration, the state had handed out its largest penalty to an environmental polluter, when it fined the Chevron oil company $900,000 for spilling nearly 140,000 gallons of oil into the Penobscot River. LePage has “made it very clear that growing jobs does not have to compete with growing the environment, and that if people want to harm Maine’s environment, and break the law, there will be penalties,” Littlefield said.